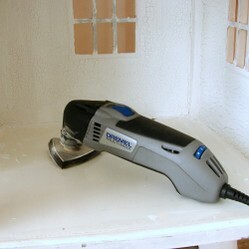 I've been restoring an old handmade dollhouse and recently bought myself the Dremel Multi-Max sander to smooth the awkward areas of some unfinished walls. I looked at some of the other hand held sanders and the sanding surfaces looked to be too large for the areas I needed to smooth. I ordered my Multimax from Amazon and the price was very reasonable. Turns out to be the best thing I've purchased for the dollhouse and I'm sure I'll end up using it on dozens of other projects around the house too. Right now I can attest to the performance of the sanding function because it's exactly what I needed to make this old dollhouse the home of my dolly dreams. The Multimax comes in a nice case with several accessories. The instructions are sparse but there is a video that shows several ways to use the tool to do things like grind out tile grout, cut pipes, install door casings, etc. Lots of home improvement projects. The video and the instructions both show the process of attaching the cutting tools, but I couldn't figure out how to put on the sanding attachment. I ended up looking up a video on youtube that showed me how it's done. You have to put the triangular piece on with an Allen Wrench that comes in the case. It has a Velcro surface and the sandpaper pieces stick right on. After the attachment question was resolved I was ready to get to work on my project. 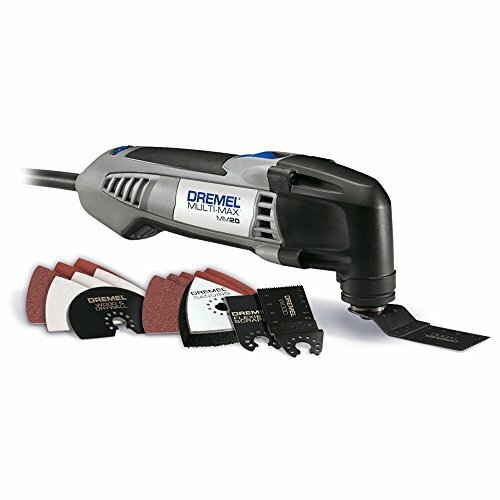 The tool has an oscillating motion that moves the sandpaper back and forth so it sands evenly. The triangle points fit into the small corners in my dollhouse perfectly. I've used it to sand down excess wood glue, uneven sheet rock pieces the original builder left unfinished, a crackle surface finish application that I put on some of the walls to simulate old peeling plaster, and a number of other things. I'm completely happy with the performance and recommend it to anyone who has light do it yourself home improvement projects or craft projects. I've been writing about my progress with the dollhouse on my blog. So far I've painted the exterior and done a couple of rooms inside. Currently I'm working on the kitchen. Both of these doll house projects I found on Craigslist. I'm having lots of fun with them. I call this one the beach cottage because it reminds me of the pastel houses in the Caribbean Islands. My husband said the color is Pepto Bismol pink. I'm leaving the exterior as is but am using my Dremel sander to sand and refinish the inside rooms. Click on the link below to visit my Diary of a Dollhouse blog and follow my progress. Hi kimbesa, I'm enjoying it for the dollhouse. In the back of my mind I've got a string of projects lined up. Thanks for commenting. If I had one of these, I'd certainly find something to do with it. Looks like an awesome tool! A pair of tin snips are a great sheet metal cutting tool. The five best tin snips tools, compared and reviewed.